On March the 15th, the Ontario Coalition Against Poverty (OCAP) officially released its report Out in the Cold on the state of the Toronto shelter system . The study’s findings are based on numerous interviews with service users and workers. It points out to a shelter system in crisis, plagued by constant overcrowding, harsh living conditions and a city government unwilling to take action. CKUT reporter Chloe interviewed one of the writers of this report for a summary of the OCAP’s findings. Some of the statistics are hard to believe. For instance, 81% of the people surveyed stated that they had been denied a shelter bed because the shelters were full (see the chart above)! Equally shocking, in most shelters occupancy levels exceeded 90% every night. This is highly problematic given that overcrowded shelters lead to a high stress environment, a poor night’s rest and health issues. Luckily, OCAP volunteers and engaged citizens are taking action against this situation. Check out this video to get an idea of the scope of the protests happening in Toronto. To get a sense of the state of the shelter system in Montreal, we also interviewed Francois Boissy who is the director of operations at La Maison du Pere, one of the largest homeless shelters in the city. He points out some of the differences between the way the cities of Toronto and Montreal deal with their homeless populations. Aside from the administrative aspect of the shelter systems of Toronto and Montreal, an important question remains: “how does it feel, for people on the ground, to experience the shelter system in both cities?” Michel, an ex-homeless man that lived on the streets for two years from 2009-2011, explained to our reporter his personal experience with Montreal shelters. In this fascinating interview he talks about the reasons why he became an itinerant in the first place, the different shelters he slept in, food conditions and how shelter services helped him get out of the streets. We are truly grateful for his trust in sharing this story, the full interview is available for stream and download below. More More I want More! For the history of the Toronto shelter system click here. On Friday, March 21st, a demonstration was held outside Mont Royal metro to mark the International day for the elimination of racial discrimination. 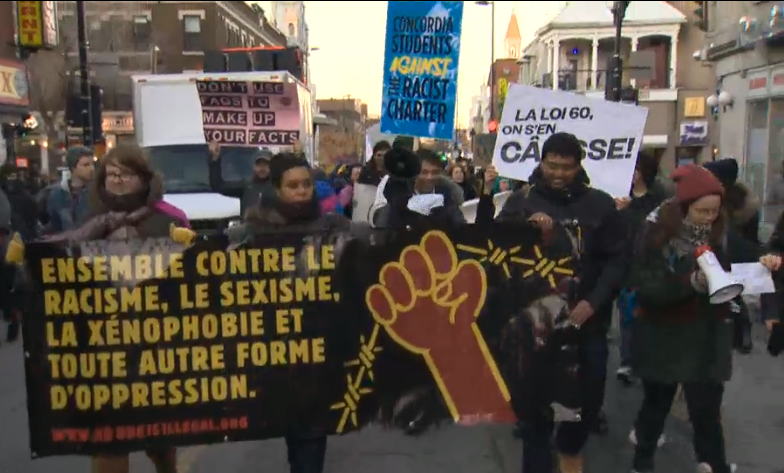 The demonstration also denounced the proposed Quebec Values Charter, also known as Bill 60, which has become a major issue in the current provincial election campaign. CKUT’s Anna Marchese was there to bring us this report.